(Bloomberg) -- Nomura Holdings Inc.’s latest attempt to revamp its international business is falling flat with investors, who’ve never been so downbeat on the stock relative to global peers. Japan’s largest brokerage has dropped almost 3 percent in Tokyo trading since Chief Executive Officer Koji Nagai unveiled a sweeping overhaul plan on April 4, bringing its six-month slide to 23 percent. That’s the second-biggest decline among major securities firms worldwide after Societe Generale SA, outpacing even notoriously poor performers like Deutsche Bank AG. 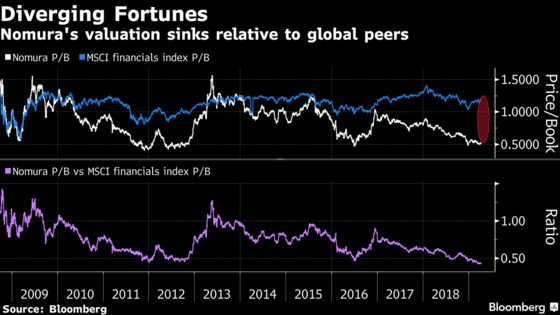 Nomura’s valuation discount versus global financial companies deepened to 58 percent this week, the widest gap since Bloomberg began tracking the data in 1999. The figures underscore entrenched skepticism over Nagai’s plans to revive a business buffeted by years of stop-start international expansions and an increasingly competitive battle for retail traders in Japan. While valuations this low have foreshadowed past rallies for Nomura, some investors are losing patience after watching the stock tumble more than 70 percent since the ill-fated takeover of Lehman Brothers Holdings Inc.’s European and Asian operations in 2008. “The market seems to be saying ‘If the recovery process takes longer, we do not need to rush back into this name,’” said Hideyasu Ban, senior research analyst at CLSA Ltd. in Tokyo. The stock closed 0.7 percent higher in Tokyo on Thursday, after earlier falling as much as 1.2 percent. Nomura watchers have cited several reasons for continued skepticism, including uncertainty about revenue growth and the pace of cost cuts. JPMorgan Chase & Co. analyst Wataru Otsuka points to questions surrounding Nagai’s pledge to slash $1 billion of costs, such as how quickly the cuts are likely to take effect and what they’ll mean for long-term profitability. “If the effort is successful and profits recover to a sustainable level, we would reconsider our investment opinion, but the details on changes to the business structure are unclear, and we expect earnings to remain sluggish," Otsuka, who has an underweight rating on the stock, wrote in an April 5 report. Shares may see a clear rebound only after Nomura’s managers unveil more details about their restructuring plan and convince the market they can execute, SMBC Nikko Securities analysts Shinichiro Nakamura and Takayuki Hara wrote in a report last week. A Nomura spokesman declined to comment on the firm’s stock price. Bulls can take some solace from history. At 0.5 times net assets, Nomura is now trading at a level that preceded rebounds in 2009, 2012 and 2016. The stock’s average price-to-book ratio over the past two decades is 1.4. Yet given market conditions that Nomura’s CEO described as “increasingly uncertain” on April 4, many investors are likely to think twice before buying.